My name is Sally Anne Thompson. The name of my bodywork business is Hands with Heart. Bodywork is my calling, which I am blessed to have finally found. I am thrilled to be part of one of the most vibrant healing arts communities in the world! I received my training and certification as a certified massage therapist (C.M.T.) from the Boulder College of Massage Therapy, which for almost four decades was recognized as one of the premier massage schools in the world. I received my training and certification as a biodynamic craniosacral therapist (B.C.S.T.) from the Colorado School of Energy Studies, which is internationally renowned for its teaching of craniosacral therapy. I am a registered yoga teacher (R.Y.T.). I offer private yoga instruction for individuals and groups. I am licensed to practice massage in the State of Colorado by the Department of Regulatory Agencies. You may recognize me from the many community events at which I have offered free and low-cost sessions to help educate the public about the benefits of massage. Perhaps we’ve crossed paths at the Taste of Therapy Wellness Fairs, ArtLink, Festival on Main, Rhythm on the River, the Longmont Triathlon, the Longmont Turkey Trot, the Lyons Outdoor Market, or the MS-150 Bike Ride. I was born and raised in Pennsylvania. I moved to Colorado four decades ago and lived in Denver for quite awhile. I also lived south of Denver in Castle Rock and Larkspur for many years. Longmont has been my home for the past 11 years. 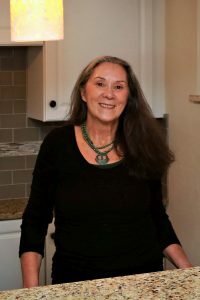 I fell in love with Longmont while I was attending massage school in Boulder and decided to put down roots and build my private practice here. I am proud to live and work in this great community. Prior to becoming a massage therapist, I earned a Bachelor of Science in Computer Information Systems and worked for many years as a technical writer. Believe me when I tell you that I know all about the toll computer work can take on the human body!